Come join 13-year-old Brenna Strong along with her mom, Bea, and her dad, Richard, as they spend a typical Saturday running errands and having fun together. What's not so typical is that Brenna's parents lawfully open carry handguns for self-defense. The Strongs join a growing number of families that are standing up for their 2nd Amendment rights by open carrying and bringing gun ownership out of the closet and into the mainstream. If you want to learn about the open carry of a handgun, or if you've wondered if open carry is right for you, then this book is what you need. My Parents Open Carry was written in the hope of providing a basic overview of the right to keep and bear arms as well as the growing practice of the open carry of a handgun. We fear our children are being raised with a biased view of the 2nd Amendment. Our goal is to provide a wholesome family book that reflects the views of the majority of the American people, i.e., that self-defense is a basic natural right and that firearms provide the most efficient means for that defense. We truly hope you will enjoy this book and read and discuss it with your children. As you read this book, you will learn about the growing practice of open carry, the 2nd Amendment and the right and responsibility of self-defense. Home School Teachers: This book is an excellent text to use as a starting point on the discussion of the 2nd Amendment. BRIAN G. JEFFS, is a senior geologist. Brian is the Co-founder of Michigan Open Carry, Inc., a non-profit organization that promotes the open carry of a handgun and works to protect all firearm rights. Brian is also on the Board of Directors for the Second Amendment March, a non-profit pro-gun organization that organized the first pro-2nd Amendment rally in Washington D.C. in 2010. He is co-host of the Political talk show AT ODDS. NATHAN R. NEPHEW is a software developer and co-founder of Michigan Open Carry, Inc., a non-profit organization that promotes the open carry of a handgun and works to protect all firearm rights. He is co-host of the Political talk show AT ODDS. His knowledge and love of firearms came from his parents. His strong passion for the 2nd Amendment began after realizing that American's rights are slowly being stripped away. Nathan graduated from Kettering University with a Bachelors in Computer Engineering. He enjoys hunting, fishing, and playing the drums in several bands. 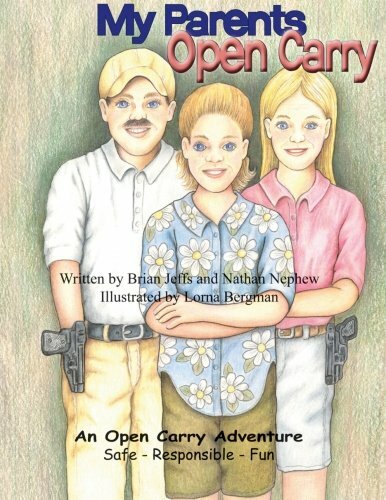 My Parents Open Carry is his first book. ARTIST LORNA BERGMAN: is a Michigan artist and has worked in various mediums. She is a hunter and enjoys shooting and deer hunting.